Kanazawa is one of historical cities in Japan that can be easily reached by 2.5 hours fast train (shinkansen) ride from Tokyo. For foreign tourists Kanazawa is popular for its samurai village, ninja temple and tea houses. For Japanese, meanwhile, Kanazawa is much more than its samurai village, tea houses and the ninja temple. It’s one of Japan’s old town and a home to one of the most beautiful garden. We went to Kanazawa during our short trip to Japan recently. 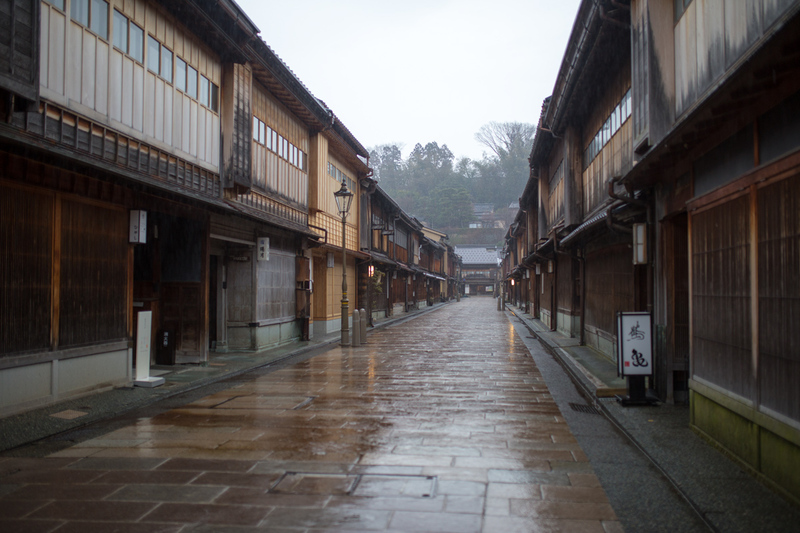 We spent 3 days and 2 nights in Kanazawa to explore the city. Initially we wanted to only spend a night only but since this was the first time Hanna travel to a different continent and facing jet lag, we decided to spend more time in Kanazawa. We visited these spots with family speed, meaning when Hanna was fussy we went back to the hotel to rest and relax. 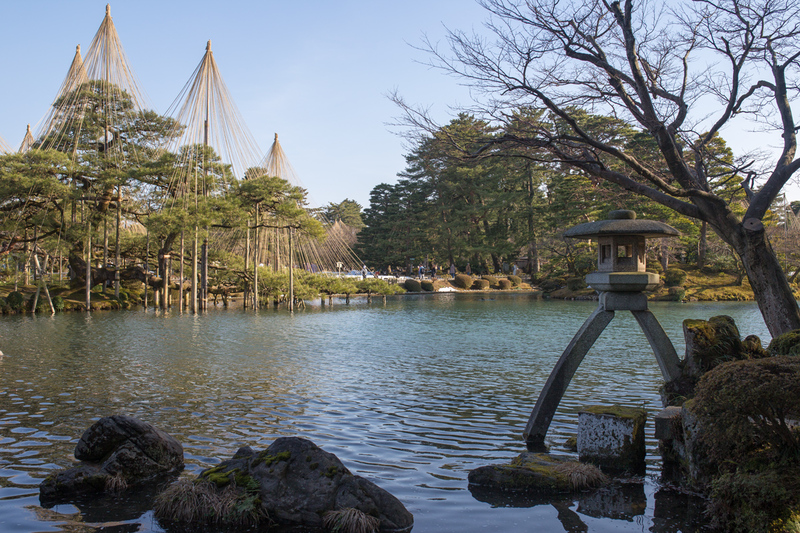 Crown as one of Japan’s most great gardens, Kenrokuen is definitely on top of the list of things to do in Kanazawa. This spacious garden used to be outer garden of Kanazawa castle that often used to entertain guests. The garden’s main spot is its Kasumi pond and Kotoji Toro lamp. The garden is open for public with admission fee. 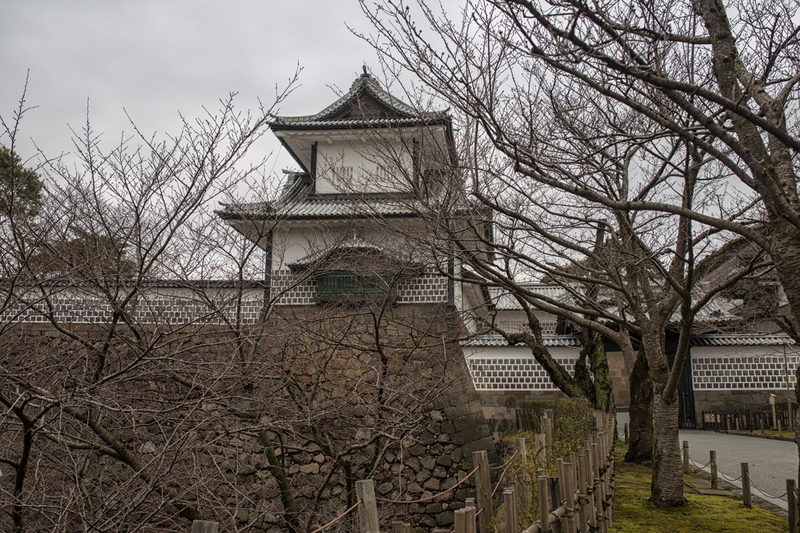 Kanazawa castle used to be the seat of Kaga Domain who ruled Kanazawa for 14 generations. This castle is located within short walking distance from Kenrokuen garden. Higashi Chaya used to be a centre of entertainment in the old days. 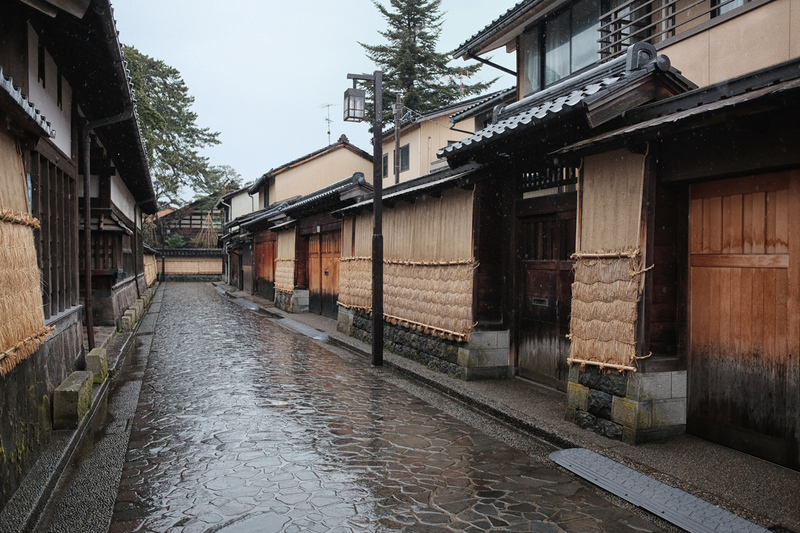 This old village was a home to geisha, playing traditional musical instruments, singing and dancing. Chaya in Japanese means tea house or room. The tea houses now open for tourists but not all allow picture taking. The two most popular chaya are Shima and Kaikaro. Taking pictures in Shima chaya with a DSLR however is not allowed. So be sure to sip green tea in one of the tea houses located within the district. Samurai were once lived in Japan. In fact, samurai era was an important part of Japan history. They were more than a legend we saw on movies. They were real in the old days. There are numbers of samurai streets in Japan but only Nagamachi Samurai Village is well preserved close to its original shape. Nowadays, some samurai houses are still within the district and some are open for public. Samurai Takada’s garden is open for public without admission fee. The samurai village can easily be reached by bus or taxi from Kanazawa train station. 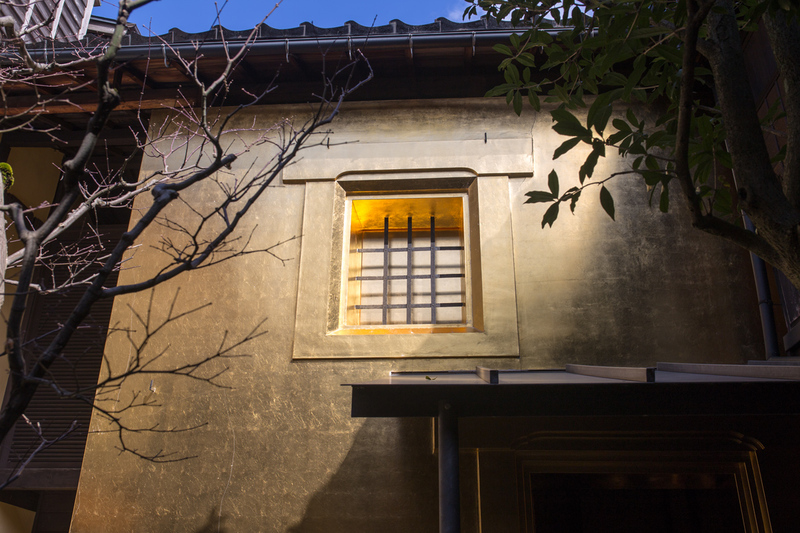 The Nomura Samurai House is the one of houses in the Nagamachi district that are open for public. The interior design of the house is preserved like its original state. This house is known for its beautiful garden and often used for drama setting. 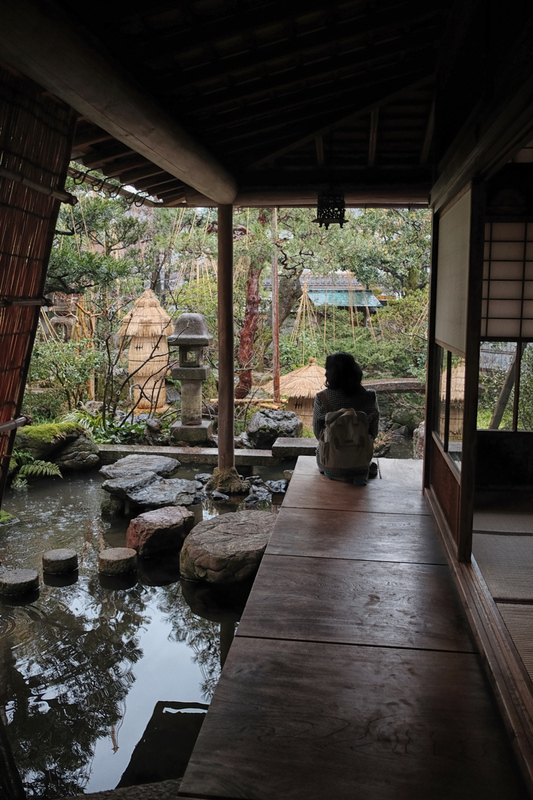 Be sure to see the tea room where samurai once sat down and enjoyed the beautiful garden view. It’s not just a market. It’s local and tourists to go to place. The market reminds me so much of Shinsaibashi market in Osaka. It’s a mini version of Shinsaibashi market yet it’s a home to so many seafood products. 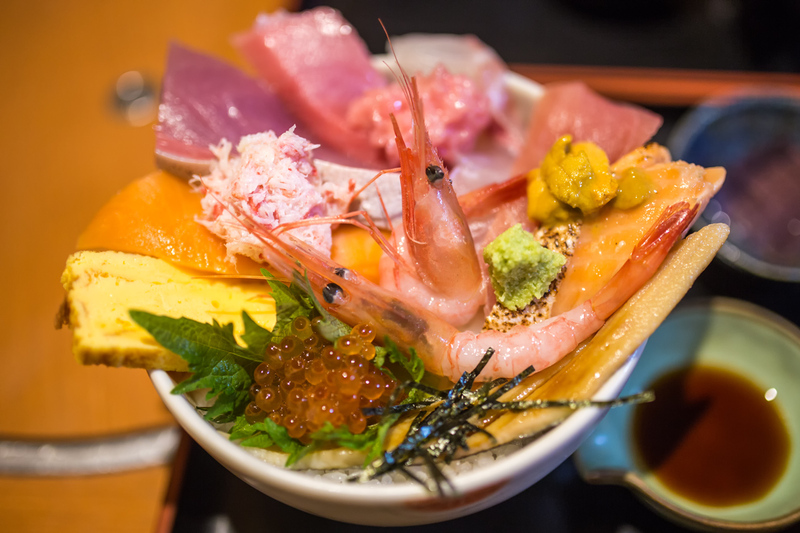 Try to dine in one of sushi restaurants and enjoy Kanazawa fresh sushi from the the market. The queue at the museum entrance alone tells you how popular the museum is for visitors (mostly are foreigners). 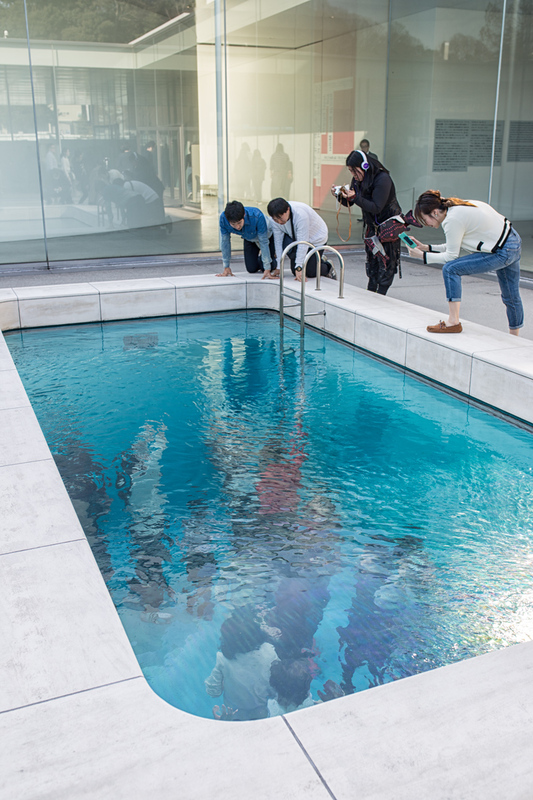 The museum is known for the swimming pool. 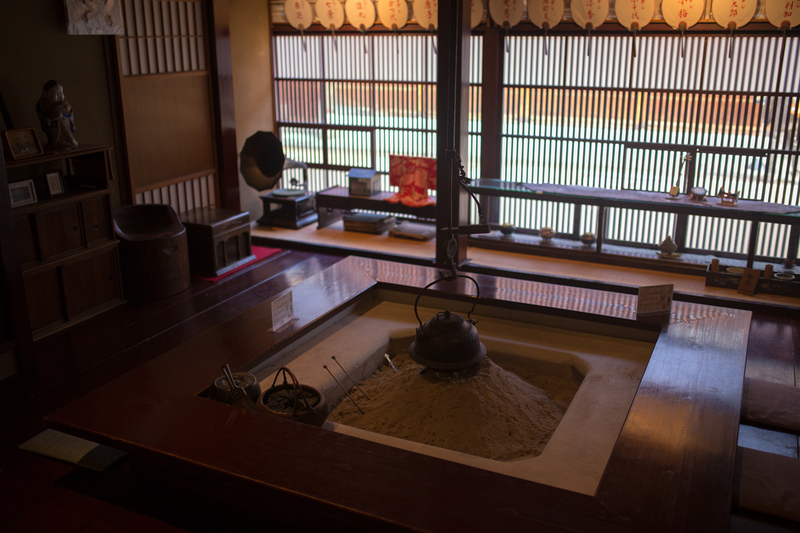 Kanazawa is known as the main producer of gold leaf since late 16th century. Currently Kanazawa produces 99% of gold leaf in Japan, 100% of domestic silver and platinum leafs. The gold leaf is made by beating the gold into an extremely thin and fragile sheet. The gold sheet is used to coat jewelries, handicraft and even used as cosmetics. In Higashi Chaya district there is a shop called Hakuza that sells gold coated items like jewellery and handicraft. It’s a great souvenir from Kanazawa. Inside the store there’s a room with gold coated walls. Kanazawa always put its gold leaf signature on many products including on ice cream and some sweets. The gold leaf on the food is edible, thus, safe to eat. 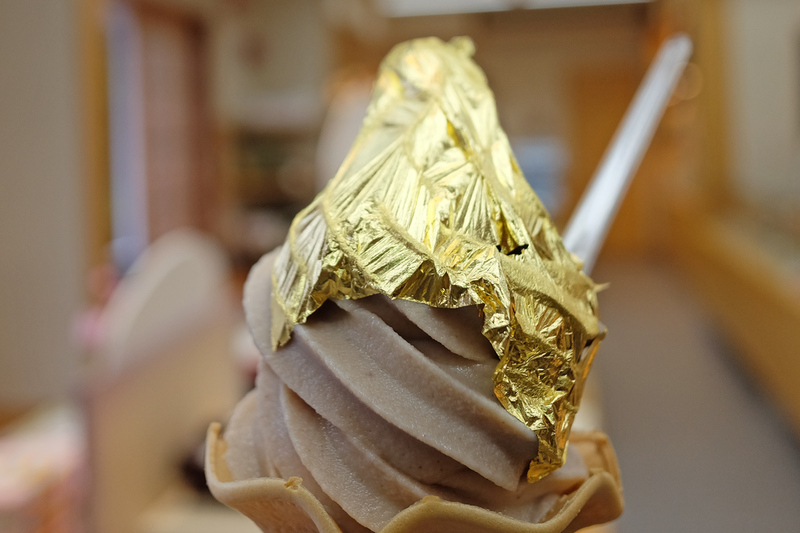 There are several places selling gold leaf coated ice cream: Samurai Village, Higashi Chaya and adjacent to the 21st Century Museum of Contemporary Art. Since there are many versions, be sure to get the ice cream with a whole gold leaf paper instead of powder. How the shopkeeper placed the fragile gold leaf on the ice cream in such a way not to ruin its shape is an attraction itself.